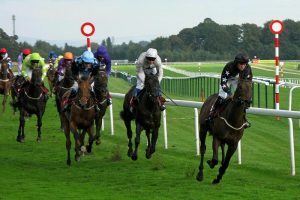 The Sprint Cup Festival is one of the most prestigious meetings of the season at Haydock Park Racecourse, on Merseyside in North West England, and is staged annually over three days in early September. Run over a straight 6 furlongs since 1986, and elevated to Group 1 status two years later, the Sprint Cup is the most valuable race staged at Haydock Park, with total prize money of £325,200 and, nowadays, is the penultimate race in the QIPCO British Champions Series Sprint Category. The Sprint Cup was inaugurated in 1966 and originally run in early November, before being switched to September in 1979. The race was the brainchild of the late Robert Sangster, whose father founded Vernons Pool, and was run as the Vernons Sprint Cup for the first 22 years of its existence. Sangster saw his own distinctive white, emerald green, and royal blue colours carried to victory by Orojoya in 1985. Initially, the Sprint Cup was open to juveniles and, in fact, the inaugural winner was the two-year-old Be Friendly, owned by the late Sir Peter O’Sullevan. Be Friendly won the Sprint Cup again in 1967 and may have done so again in 1968, but for the abandonment of the meeting due to fog. Nevertheless, he remains the only horse to have won the Sprint Cup twice and his achievement is commemorated by a life-size statue overlooking the paddock at Haydock Park. Other notable winners of the Sprint Cup include Habibti in 1983 and Dayjur in 1990. Coincidentally, both were ridden by Willie Carson, both also won the Prix de l’Abbaye de Longchamp the following month and both were named British Horse of the Year. The late John Dunlop, who trained Habibti, also saddled Runnett (1981), Lavinia Fontana (1994) and Invincible Spirit (2002) to win the Sprint Cup and remains the most successful trainer in the history of the race. The supporting card for the Sprint Cup also includes the Superior Mile Stakes, a Group 3 contest run over 1 mile and 37 yards, and the Old Borough Cup, a valuable and historic ‘heritage’ handicap run over 1 mile 6 furlongs. Both races are open to horses aged three years and upwards.